The Washington County Historical Society announces the Stillwater Historic Homes Tour on Sunday October 7th from Noon to 5pm. This tour will have ten very distinct homes that span more than a half a century. The Sauntry Moorish Style Recreation Hall will be featured on the tour. Sauntry’s Hall, constructed in 1902 by Lumber Baron William Sauntry, took its theme from the elaborate Alhambra palace in Granada, Spain, in all of its fantastical and painstaking Moorish detail along with elements of the Craftsman tradition. 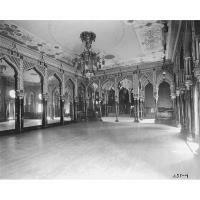 The high-ceiling ballroom was decorated with a ceiling mural, carved plaster, gilded medallions, and crystal chandeliers, along with 14-foot, 250-pound mirrors. Stencils of Arabic inscriptions are also found on the walls. Upon its initial opening, the local paper called it a "Fairyland." The other homes on the tour are also some of Stillwater’s most significant including Stillwater’s oldest standing home, the Brunswick House, constructed in 1848 before Minnesota was a Territory. The Warden’s House, which was built in 1853 while Minnesota was a Territory; the Storkamp House on Olive Street was built in 1875; St. Mary’s Catholic Church’s rectory built in 1888 on 5th Street South; the Murdock House on Laurel built in 1859; the Castle house on South 3rd and the Pretzell House also on Olive Street. Two fine Bed & Breakfasts are also on the tour – the Ann Bean and the Aurora Staples Bed & Breakfast. Each house on the tour has a local business sponsor, showing again how the business community rises up to help the area’s unique heritage. The funds raised will go to the preservation and dissemination of local and regional history. Tickets are available the day of the tour at the Warden’s House Museum, 602 North Main Street, and are $25 each. For more information contact the Historical Society at 651-439-5956 or visit www.wchsmn.org to order your tickets online.